Every year there are several articles written that the resume is dead or dying. Since the year 1999. Yet 20 years later the resume is still here and very much a part of the hiring process and personal marketing portfolio. But there is a resume rule that truly must die. Which resume rule is that? 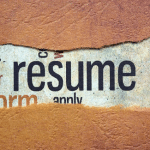 Why should this resume rule die? (1) If you have over 10 years of experience, it is perfectly acceptable that your resume is two pages. In fact, two pages is preferable. To keep your 10+ years on one page can make your background look like it doesn’t have depth, because you are only including the highlights since you are trying to cram it all on one page. If you have less than 10 years of experience, a one page resume is acceptable. (2) A poorly-written one page resume still will not be read. People who often tout the “one page resume rule” couple it with the illogical rationale that if it is longer, the resume won’t get read. Nonsense. Poorly written resumes that don’t keep the attention of the reader in 5-10 second increments won’t get read at any length. Well-written two page resumes that use tactics to keep the attention of the reader are read from beginning to end—and called in for interviews. (3) Just because Elon Musk’s and Marissa Mayer’s resumes are one page doesn’t mean you or I should use a one page resume. With all due respect, Elon Musk and Marissa Mayer do not need resumes—their reputations precede them. In many cases, us regular folk need our resume to sell us to convince someone to interview us and our reputations are not plastered on business publication covers where the hiring manager knows us before meeting us. We need more help by having a two page resume. Ed is the inspiration for this article… thank you, Ed! So now that you know what shouldn’t be included in a resume, I want to show you what should be in a resume. Use achievement-oriented language that emphasizes your accomplishments instead of recycling boring resume content. Create an immediate visual punch with ATS-digestible graphics that makes you stand out from the pack instantly rather than regurgitating your standard bland, common and repetitive layout. Weave in targeted keywords into your resume content that make it easy for recruiters to identify you in their databases instead of glazing over your uninspiring, empty words. Produce a resume layout that makes it EASY for a hiring manager's brain to absorb your honest assets instead of trying to hide your resume blemishes, conceal your jumpy background, or downplay your recent lack of success.